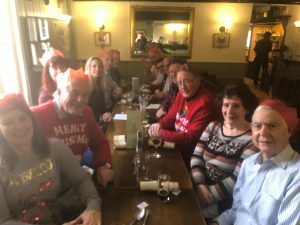 Pictured here are some members of Boreham Parish Council enjoying their Christmas lunch at the Six Bells (funded by members and staff of the council). Boreham Parish Council would like to take this opportunity to wish all residents a very Merry Christmas and a Happy New Year. The December Magazine has arrived! The December Parish Magazine has been printed and should be delivered to all of the homes in Boreham shortly. We would like to thank the Christine Baynes-King and her volunteer helpers for their continued support in delivering the newsletters. Chelmsford City Council Parks Department are hosting a volunteering event to clear the area around the pond in the Willows, Boreham. The event will be on 29 November 2018, between 10-12. All are welcome. Please wear appropriate footwear and wet weather gear. Please find the link to the latest Parish Newsletter which will be delivered to all homes in Boreham.